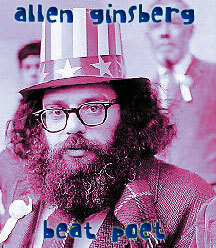 Irwin Allen Ginsberg was born on 3 June 1926 in Newark, New Jersey. His father Louis was a school teacher and poet, known for his word play. "Is life worth living? It depends on the liver" and "I've got no axiom to grind" were two remembered examples. His mother was a radical communist who idolized Stalin. Throughout her life she was in and out of mental institutions. He later stated that his "mother made up bedtime stories that all went something like: "The good king rode forth from his castle, saw the suffering workers and healed them." At age 15, writes letter to New York Times about political issues such as WWII and the plight of the workers. About those he saw as guilty parties he writes: "One can gather infinite consolation by speculation as to what will happen to those Congressmen when they go to Hell." Prays to save the Working Class of America if he is admitted to Columbia University. He is, and attends, with the assistance of a stipend from the Y.M.H.A., intending to study pre-Law. In December of 1943, meets Lucien Carr at Columbia University. Carr introduces him to David Kammerer, William S. Burroughs and Jack Kerouac. A literary movement begins to slouch towards its beatific birth. Gives up the study of Law to pursue that of Literature, excels as a student with teachers such as Mark Van Doren and Lionel Trilling. Profoundly influenced by the visionary poetics of William Blake, the American exuberance of Walt Whitman, and the modern sensibilities of William Carlos Williams. Edits the humor magazine, The Jester, is on the debate team, and helps run the literary society. Ginsberg is suspended from Columbia in the Spring of 1945 for allowing a distraught Kerouac to sleep in his room, and for writing "Butler has no Balls" (for the president of Columbia, Nicholas Butler) on his window. Ginsberg the "A" student becomes disillusioned with the academic establishment. That July, Ginsberg begins training to become a merchant seaman. However, on the 6th and 9th of August 1945, the US drop the bombs on Hiroshima and Nagasaki, effectively ending the war and forever changing human history. The merchant seaman training center is closed. Ginsberg begins experimenting with drugs, primarily Benzedrine and marijuana, hanging out in Times Square with Burroughs and Kerouac, attempting to realize the lived poetry of a "New Vision". Early in 1947, meets Neal Cassady, begins intense intellectual and, somewhat unreciprocated, physical relationship with him. They travel to Texas to visit Burroughs and Herbert Huncke. In the summer of 1948, Ginsberg has a profound vision while reading Blake, claims to have found God. He makes the bizarre attempt to "go straight," enters into psychoanalysis, dates a woman, finds a job as a marketing researcher. Ginsberg is arrested in April of 1949 while riding in a car stolen by some of Huncke's friends. Allen pleads insanity, ends up going to the Columbia Psychiatric Institute for eight months. It is there that he meets Carl Soloman, to whom he later dedicates Howl. Is graduated from Columbia in 1949 with a BA. August 1951, drives with Lucien Carr to Mexico City to visit the Burroughs'. Impressed with the richness of the culture, his perspective on the US shifts. Moves to San Francisco, takes an apartment in North Beach, meets Kenneth Rexroth, who impresses Ginsberg with his balance of social activism and poetry. He is also introduced to Robert Duncan who encourages Ginsberg to break away from the influence of Williams, supports his enthusiasm with Kerouac's "spontaneous poetics". He resumes his attempts at normalcy, working for another market research firm. In December of 1954 he meets Peter Orlovsky, they become lovers, forming a lifelong relationship. Ginsberg shakes off the chains of social conformity, quits job as market researcher, moves in with Orlovsky. In the summer of 1955, Ginsberg begins what will eventually become "Howl:" "I saw the best mind angel-headed hipster damned." On the 13th of October 1955, at the Six Gallery, Ginsberg delivers a mythic reading of "Howl". Kerouac MCs, punctuates reading with slaps on a jug of wine and shouts of "GO!" Obscenity charges leveled against "Howl", further assuring its success and significance. Lawrence Ferlinghetti publishes Howl and Other Poems in 1956. Ginsberg's mother dies in 1956. Two days before she died, he received a letter from her that said: "The key is in the window, the key is in the sunlight in the window - I have the key - get married Allen don't take drugs... Love, your mother." Ginsberg and Orlovsky go to visit Burroughs in Tangiers in 1957, assist in helping Burroughs to organize The Naked Lunch. In December of 1960, Ginsberg meets Timothy Leary, who initiates him into the Harvard Psilocybin Project with nine psilocybin pills. Tries to call Kerouac as God, wants to go out in the street, stark, hysterical and naked to preach peace and love. He is everywhere in the 60's, preaching the psychedelic gospel; traveling to India and Japan; getting kicked out of Cuba and Prague; standing in alley in film of Bob Dylan's 1965 'Subterranean Homesick Blues'; taking a part in the Acid Tests with Ken Kesey; leading the crowd in chanting OM at the Be-in in San Francisco in 1967 with Gary Snyder and Michael McClure; Protesting the war at the Chicago Democratic Convention in 1968; testifying at the trial of the Chicago Seven; building an impressive FBI file. In a memorandum from J. Edgar Hoover to the Secret Service in 1965, Ginsberg was cited as an "Internal Security--Cuba" case, and a potential threat to the president of the United States. On the document, stamped 'Secret', Ginsberg was listed as "potentially dangerous" and a "subversive," with "evidence of emotional instability (including unstable residence and employment record) or irrational or suicidal behavior," as having made "expressions of strong or violent anti U.S. sentiment," and as having "a propensity for violence and antipathy toward good order and government." All such items were checked on a form in his file. Meets Chogyam Trungpa Rinpoche in 1970, whom he accepts as his guru. With Anne Waldman helps to found the Jack Kerouac School of Disembodied Poetics, at Trungpa's Naropa Institute in Boulder, Colorado. The Fall of America wins the National Book Award in 1972. Tours with Bob Dylan In the Rolling Thunder Revue in 1977. Tours and reads tirelessly through the 80's, ever deepening his commitment to Buddhism, keeping the Beat flame alive. Dies of liver cancer on April 5th, 1997 in the East Village, New York City. Ginsberg reportedly composed a handful of short poems the day before his death, including one titled "On Fame and Death." In this poem, which ran in the New Yorker the week following his demise, he imagines the big crowds at his funeral and hopes that one of them would testify: "He gave great head." Poetry In Motion, VHS, 1982. Performances by Allen Ginsberg, Charles Bukowski, William S. Burroughs, Tom Waits, Ann Waldman, and many others.